The ancient city of Bagan lies along the Irrawaddy River approximately 450 miles (618 km) north of Yangon in Myanmar’s Mandalay region. 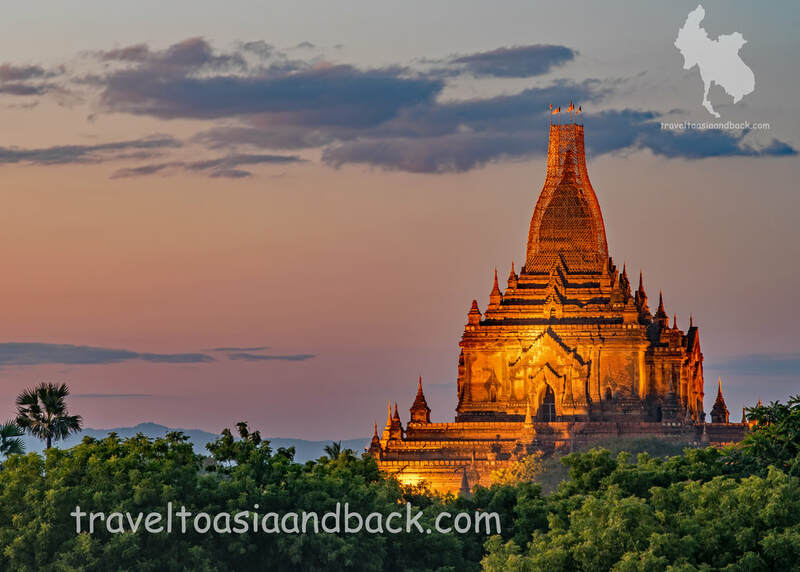 Bagan was the capital of the Pagan Kingdom which existed from the 9th-13th centuries. The prosperous Kingdom was an important city where Buddhism flourished. During its peak years (1044-1287) over 10,000 temples, stupas and other religious monuments were built. 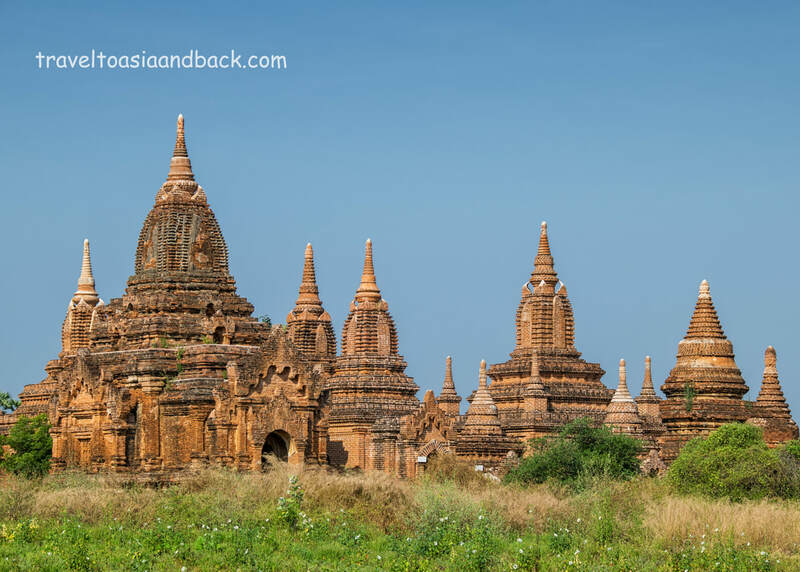 Today, the remains of 2200 of these religious monuments make up the Bagan archaeological zone. It is fair to say that Bagan is Myanmar’s primary attraction and many people travel to the country specifically to visit this ancient city. The 40 square mile (104 km²) area on the Bagan Plains is often compared to Angkor Wat. That analogy is some what accurate although Bagan’s ruins contain many individual monuments such as stupas, which are spread out over a larger area. The overall visual effect and feeling is much different particularly when viewed from the tops of temples like Bulethi (Buledi) or from a hot air balloon. Some of the biggest and most famous sites such as Ananda and Sulamani temple will, from time to time, be inundated with tour groups. However, it's easy to get away from other visitors by getting “lost” on the plain. 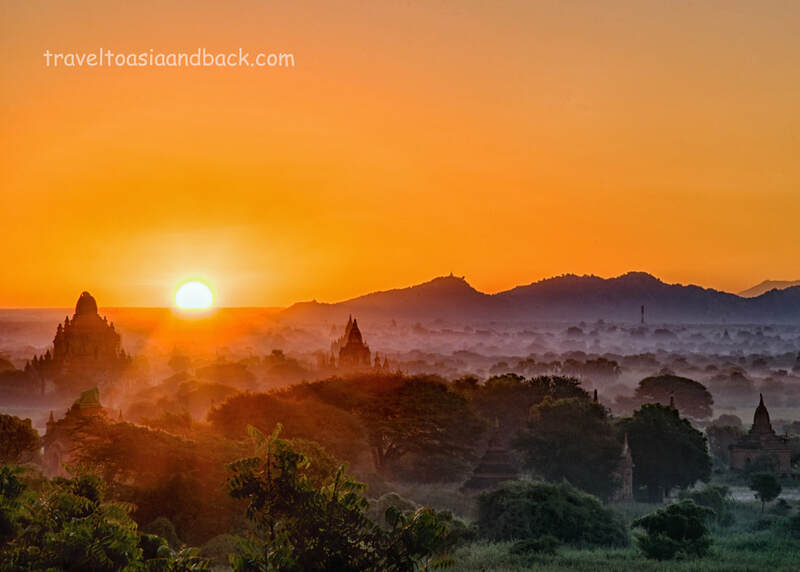 Bagan’s archaeological zone is easily accessed from the nearby towns of Nyaung Oo & Old Bagan. Most of the budget accommodations will be found in Nyaung Oo some of which are near Thi Ri Pyitsaya 4 street also known as “restaurant row”. This area is about 3 miles (5 km) from the Tharabar Gate at Old Bagan. The majority of independent travelers to Bagan will rent scooters or e-bikes to get around as the site are spread out over a fairly large area. Many guest houses provide their guests with bicycles. A novel way to tour the area is by horse cart, which can be hired for one way trips or by the hour. Be forewarned; this means of transportation is tremendously uncomfortable as the cart bounces, and shakes over the rocky unpaved ground around the historic sites. It is slow as well; a person in good shape can easily out pace a fully loaded cart. Bagan (Nyaung Oo) can be reached by plan, bus, train or boat depending on your starting point. Of course the fastest and easiest way is flying into Nyaung Oo (NYU). A number of national carriers make daily flights from Yangon and Mandalay. Asian Wings and Air KBZ are a few of the country’s reputable domestic carriers which allow on line bookings. We recommend booking flights directly with these airlines and avoid using third parties like travel agencies. Bus travel to Bagan is a good inexpensive option. A number of companies operate large, comfortable, air-conditioned motor coaches to and from popular travelers’ destinations such as Kalaw, Inle Lake, Mandalay, Pyay, Thazi and Yangon. The bus trip from Yangon takes nine hours including several stops for snack and bathroom breaks at surprisingly modern and clean highway rest areas. If purchased from a travel agent, tickets cost $16 to $19 USD. The bus journey from Mandalay takes five hours and usually costs less than $10 USD. Presently there is only one direct over night sleeper train from Yangon. Departing at 04:00 PM, the scheduled travel time is 17.5 hours, but trains in Myanmar often run late and travelers should expect delays. Ticket prices range from $4 USD for a seat in “ordinary class” to $17 USD for an “upper class” sleeper berth. As the price of a sleeper berth is only slightly less than a bus ticket, we feel that a bus is a much better option. Two trains depart from Mandalay to Bagan every morning at 04:00 and 07:00. The journey takes just under 12 hours and costs approximately $2 USD for a first class ticket. One of the most popular stretches for boat travel in Myanmar is between Bagan and Mandalay. One of the newest vessels on the river is the R/V Panorama operated by Alliance Myanmar River Cruise. On Tuesdays, Thursdays and Saturdays the Panorama makes the up the river voyage from Bagan to Mandalay in approximately 12 hours. On Mondays, Wednesdays and Fridays she makes the trip from Mandalay to Bagan in 10 hours depending on the height of the river. Breakfast, lunch and non-alcoholic beverages are included in the ticket price. Cruising the Irrawaddy on the Panorama may cost more than a bus or train but it is far more relaxing and is an excellent way of seeing how local people live and work on the river. Travelers should note that during periods of low water, typically February to May, river travel is often curtailed or even impossible. The availability of boats on any given route also depends on demand. Boat companies generally operate more vessels during the height of tourist season which runs from the beginning of October until the end of March. Taung Kalat is enormous mass of volcanic rock, topped with a golden colored Buddhist monastery. 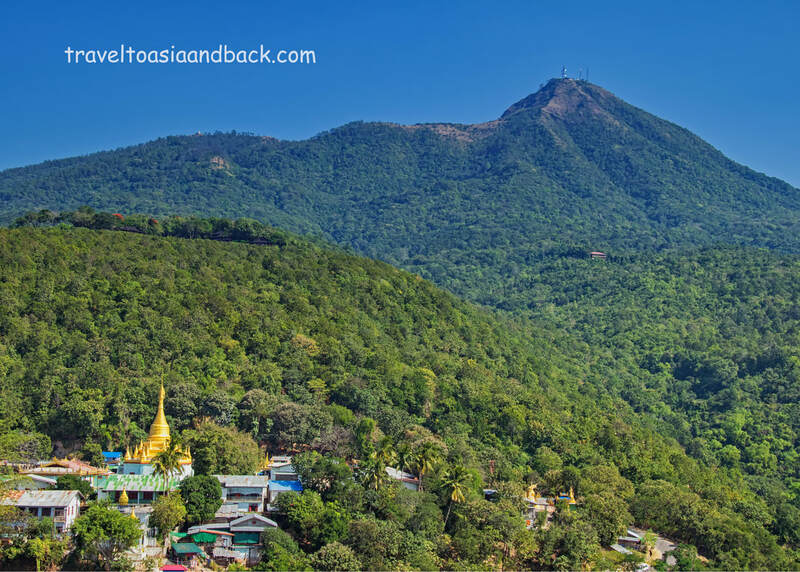 Towering over 3700 feet (1150 m) above the village below it; Taung Kalat is commonly referred to as Mount Popa. In reality Mount Popa is the extinct volcano that this plug of rock came to rest on. This is an important pilgrimage site for the people of Myanmar who come to prey and make offerings to the Nat (animist) spirits. Located 31 miles (50 km) from Bagan, Taung Kalat is also a very popular tourist attraction. Share taxis can be easily organized for $8-10 USD. Travel time to the site is approximately one and a half hours. Although the view from the top is very impressive, it requires a climb up 777 stairs, some of which are very steep. To make matters worse, you must make the assent barefoot. The stairways and hand rails are generally filthy; mostly due to the large number of monkeys which inhabit Taung Kalat. It is advisable to bring a good quantity of baby wipes to clean both hands and feet.